Rail services remain disrupted after torrential rain in parts of Scotland and northern England caused flooding and landslides. Hourly services are now running on the East Coast main line between Scotland and Newcastle, which had been blocked. There is also severe disruption in the west Highlands following a freight train derailment near Tulloch, and a landslip at Arrochar. A train delayed by flooding in Cumbria then caught fire near Lockerbie. Hundreds of people were stuck on the Virgin London to Glasgow service for up to 15 hours. Rail services on the West Coast main line have resumed after overnight disruption. However, a backlog of passengers waiting to travel south led to long queues at Glasgow Central station. Donna Wolff, who was travelling with her three children - aged six, seven and eight - from Shetland to London was among those stuck in what she described as "over a mile-long queue." She told BBC Scotland "I was only supposed to be going from Aberdeen straight down but got to Aberdeen to be told the east line was shut and we had to go west." Chris Connell, who was heading to Manchester for a Stone Roses concert, said: "It's been a nightmare. We are supposed to be meeting friends. It's horrendous, but we are getting on with it and the gig is not till tomorrow night so we will be there." Nick King from Network Rail told BBC Radio Scotland the problems on the tracks were a result of unprecedented circumstances. He said: "The sheer volume of water has overwhelmed embankments at certain points. "We had extra staff out through the night. "We have more staff, and specialist staff on standby, ready to react and be called in at certain sites depending on the nature of the damage or the nature of the material needing cleared." Two landslips led to the closure of the East Coast main line - one at Scremerston in Northumberland and one at Spittal, south of Berwick. Thousands of people in Scotland are facing serious disruption, mainly on the railways - but the start of the summer holidays could have been so much worse. As they approached the border, the powerful thunderstorms which wreaked havoc in the north east of England began to swing out over the North Sea. It meant that Scotland avoided the worst deluge, although heavy showers did cause problems in the West Highlands, where engineers are facing a difficult operation to recover a 24-wagon freight train which came off the tracks between Corrour and Tulloch. They're also struggling to reopen the east coast main line which was blocked by two landslides, both just south of Berwick-upon-Tweed. As a result Glasgow Central Station is becoming a pinch point as travellers flock west to head south. So Scotland is suffering disruption and delay, but at least it is not counting the cost of flooded homes and ruined businesses. It had reopened by 12:25 on Friday, earlier than anticipated. A Virgin Trains west coast service from London to Glasgow, which set off at 11:30, was stranded in the Lake District between two landslides. Susie Fraser, from Glasgow, was stuck on the train for three hours, before abandoning the service in Lancaster. She told BBC Scotland: "It was total chaos, there were some very upset children on that train. It is quite humid obviously, there's lots of thunder storms, so it was very uncomfortable." After being diverted then heading north the front carriages had to be evacuated after the reports of a fire. Passengers were helped onto the tracks using ladders. The service, which had dozens of people on board, was halted before returning to Lockerbie. Virgin Trains said alternative transport was arranged to Glasgow after a "minor engine fire". One man, who was among a group of passengers who arrived back in Glasgow in the early hours of the morning, after a 15-hour journey, told BBC Scotland: "It is appalling, terrible. "We've been standing for about four-and-a-half hours and everybody had to get off the train at some point because of the fire. "It was just complete chaos." BBC Scotland sports pundit Chick Young was also among those stuck on the Glasgow-bound service. He said: "Two trains were linked together and the front train caught on fire. "The train was quickly brought to a halt and the passengers in the front train were evacuated. I think they had a bit of a problem finding ladders to get old people off the train." A 24-wagon freight train derailed between Corrour and Tulloch closing the line between Crianlarich and Mallaig. The driver was unhurt but shaken. 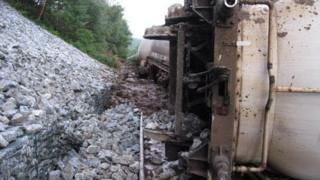 The remote location will make it difficult to recover the derailed train and it is not known when services will resume. The West Highland line remains blocked between Fort William and Crianlarich and Crianlarich and Glasgow. A ScotRail spokesman said: "We are doing everything we possibly can to help our customers and have extra staff on hand to help at stations. "Customers are advised to get up-to-date journey information before travelling."